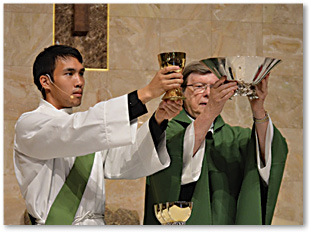 As Deacon John Vu prepares to be ordained a priest, he ponders about 50 years down the road and presenting to a seminarian a chalice given to him by a priest celebrating his 50th anniversary to the priesthood this year. In July 2009 Deacon Vu was discerning at St. Joseph’s Seminary in St. Benedict whether he should leave or continue his journey to become a priest. He accepted an invitation by Father Paul Gros to attend a luncheon with him at Immaculate Conception Church that set him confidently on the path to the priesthood. At the luncheon the ICC staff celebrated with Father Uter the fifth anniversary of their coming together as a staff and Father Gros’ fifth anniversary ordination to the priesthood and first assignment at ICC as parochial vicar. “We had a nice time; young John Vu didn’t say much as he was a bit shy,” recalled Father Uter. After thanking everyone at the end of the meal, Father Uter mentioned that in 2019 he would be ordained to the priesthood for 50 years. “We all heard from John Vu, loud and clear. ‘That’s when I will be ordained,’ ” said Father Uter. When Deacon Vu was at ICC, Father Uter had a nameplate made with Deacon Vu’s name on it. After Communion at Deacon Vu’s going away liturgy Oct. 13, Father Uter gave Deacon Vu his chalice, along with the papers with the design of the chalice. Deacon Vu said the offering bolstered his commitment to pursue his vocation to the priesthood. “When he offered me that chalice, he had the confidence that I would finish formation and I would become a priest. And I thought to myself … ‘You know if he had that confidence …’ Then I told him if God calls me to the priesthood I would be glad to receive it from him,” said Deacon Vu. As he accompanied Father Uter during his daily life during his internship, Deacon Vu said he learned a lot about what it means to be a minister of God’s word and sacraments. Such lessons were among the nuggets of knowledge Deacon Vu gleaned from Father Uter. “He’s a great priest,” said Deacon Vu. “He’s been a priest for almost 50 years. So there’s a lot to be learned from him. He has a lot of wisdom to give. So I was thrilled that he also has one of the biggest parishes in the Baton Rouge diocese. And that was the experience that I was missing being at smaller parishes (for summer seminarian assignments). So I was really happy that I was being assigned to a bigger parish with a priest that is very skilled, very prayerful and holy. Deacon Vu is scheduled to be ordained to the priesthood along with Deacon Timothy Grimes on May 25 at St. Joseph Cathedral.